Here's the latest free hard drive data recovery program to be offered, and as always I advise you to maintain separate, removable media, to back up your precious digital photo files. Of course the use of removable media for backup extends beyond your photo files and should include all files that you consider "must haves." The "iCare", "Data Recovery 3.6" Software, is a bit more advanced than some past free offerings and deserves a look, particularly since it's free. 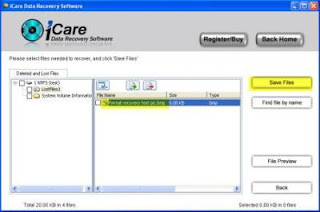 Besides the usual data loss recovery feature "iCare's", "Data Recovery 3.6" Software allows you to recover deleted hard drive partitions, perform "deep scan recoveries" and "format recoveries." Get your free iCare Data Recovery 3.6 Software before the offer is rescinded at midnight tonight. Take a camera with you whenever possible, and look around, you'll find a picture somewhere.